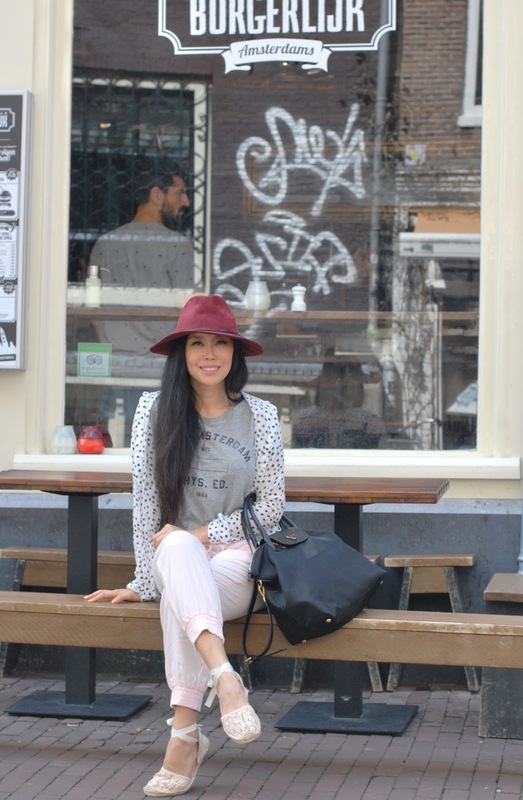 I picked up this Esprit fedora in Amsterdam and it didn't leave my head the rest of the trip! The weather in Amsterdam was a bit nippy and while I brought the necessary provisions to combat the chill in the air, M didn't (shocking because he's the planner). Since we wanted to spend an afternoon retracing my Amazing Race bike route, he needed to buy a jacket to layer up against the elements. Before the word shopping fully escaped from his mouth, I was already 100% onboard and ready to go. You never have to convince me to go buy things I most likely don't need or already have. I'm always in. Our first stop was the Esprit store, a childhood favorite whose brick and mortars have eroded in the US. He tries on a black leather bomber jacket. It fits, it looks good, and just like that our shopping trip is over before it really even warmed up. To mask my disappointment and savor the moment for just a bit longer, I head down to the hat section and pick up a dark red fedora hued with a unique shade of magenta. I love it but know it's an irrational time and place to buy a hat as they mix with bike rides as well as oil and vinegar. Plus, hats are notoriously difficult to transport while traveling. But when has shopping ever been about rational or sensible thinking? I wear the hat while debating the pos and cons and circle each mirror at least twice. I ask M for his opinion and the opinions of three other strangers. They all give me the thumbs up. I had to have it. I end up wearing it on the bike ride (it flew off only twice! ), the day after, and throughout our time in Brussels. I even wear it on our flight back home. I've literally never gotten so much mileage from a hat. And that's the origin story of my new favorite fedora. I admit, it's not a hold on to the edge of your seat nail biter but goddamnit you share love for the things you love!